Experimental cutaneous leishmaniasis of mice is a valuable model to study the immune response to the protozoan pathogen Leishmania and to define mechanisms of parasite control and resolution of inflammation as well as of parasite evasion and chronicity of disease. In addition, over many years Leishmania-infected mice have been successfully used to analyze the function of newly discovered immune cell types, transcription factors, cytokines, and effector mechanisms in vivo. In this chapter we present detailed protocols for the culture, propagation, and inoculation of Leishmania promastigotes, the monitoring of the course of cutaneous infection, the determination of the tissue parasite burden and for the phenotyping of the ensuing immune response. 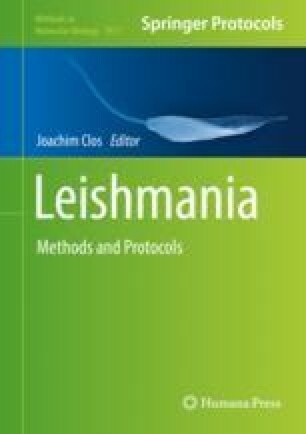 The focus lies on the L. major mouse model, but an overview on other established models of murine cutaneous leishmaniasis is also provided. The preparation of the manuscript and some of the studies reviewed were supported by the Deutsche Forschungsgemeinschaft (SFB1181, project C4; GK1660, project A5; SPP1937, Bo996/5-1), the Interdisciplinary Center for Clinical Research (IZKF) of the Universitätsklinikum Erlangen (project A61 and A63), and the Bundesministerium für Bildung und Forschung (BMBF; Infect-Era “EpiCross”).